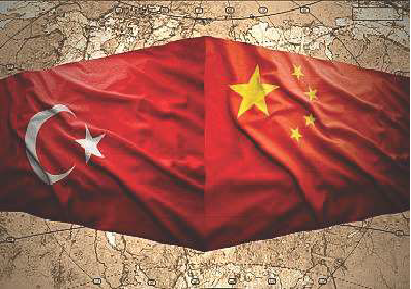 A road map with nine steps to make Turkey-China economic relations sustainable and balanced has been released by the Foreign Economic Relations Board (DEIK) and Turkey-China Business Council. The report penned by Sabanci University Istanbul Policy Center expert Altay Atli includes a comprehensive and high-quality road map for decision makers and the business world. The head of DEIK, Ömer Cihad Vardan, emphasized the importance of historic relations between Turkey and China. Vardan said that the two extreme sides of the historic Silk Road, Shanghai and Istanbul, can write history again and in this context, in 2017, they will be talking about China and Asia-Pacific a lot. He said that while the global economy is becoming more 'Asian,' as the second biggest economic power in the world, China, with its initiatives, is becoming the pioneer of the globalization process. Vardan also said that it was a must rather than an option that a sustainable, high-quality and high-volume economic cooperation with high-added value be established with China. According to foreign trade data from Turkey and China, the total foreign trade volume in 2015 was $27 billion. Turkey's exports to China are worth $2.4 billion, primarily consisting of marble and natural stone, chromium ore, co-pper ore, lead ore, zinc ore and chemicals. Turkey's imports from China amount to $24 billion, mostly telephone apparatuses, automatic data processing devices, iron and steel semi-products and synthetic filament yarns. The total balance of foreign trade is $22.4 billion in favour of China. The report consists of six main chapters including exports, imports, investments, service trade and supporting components. The foreign trade deficit between China and Turkey is growing in favour of China. For every $1 in exports that Turkey makes to China, it imports more than $10 worth of goods and services. If this trend continues, if the target of $100 billion foreign trade volume is reached in 2020, then this would put an $80 billion burden of Turkey's current accounts deficit. The action plan to reverse this situation contains several suggestions. These intermediate goods imports should be designed to contribute the highest added value to Turkey's economy. High-quality intermediate goods should be encouraged. China increases its foreign investments with an average of 10 per cent every year. Several fields especially those that would help Turkey reach its development goals should be focused on for investments coming from China, making mutual benefits possible. China offers attractive investment opportunities for Turkish firms. Free trade zones in China, certain regions where competition is weak and incentives are high and the service sector should be priorities for Turkish firms. Also, the rapidly growing and developing middle class in China has increasing needs for foreign-origin goods and services. In its service exports to China, Turkey seems to have the biggest potential in the tourism sector.